This is more than just a homemade version of a guilty pleasure food. This is my #1 go-to road trip meal. I love Taco Bell crunch wrap supreme, except I always substitute the ground beef for refried beans. Next time I go I think I’ll see if they can make it with black beans, as I think I heard they have a new black bean burrito. A crunch wrap supreme just feels more interesting, flavor-wise, than a plain bean burrito. I also like their seven layer burrito, but I love how the crunch wrap just feels easier to eat. That’s a high priority if you’re road tripping and you don’t want burrito all over your passenger seat. This homemade version is actually pretty healthy, and it allows you to add more of your favorite flavors (avocado!) and go light on anything you don’t love (tomatoes!). Homemade Crunch Wrap Supreme, makes six. Start by sauteing the garlic and onion in a tablespoon of olive oil. Once softened add the refried beans and cumin; stir to combine. Cook until warmed through. In a small bowl mash up the avocados (removing the skin and seed first, of course). Stir in juice from half the lime and the cilantro. Taste and add a little salt if you like. Set aside. Cook the corn tortillas in a hot skillet with a tablespoon of oil. The goal is to get the corn tortillas crispy, but not burnt. As I cook these I like to place them in between layers of paper towels (once removed from the skillet) to soak up any extra oil. Set aside. Now assemble the crunch wraps. This is the fun part. Onto one large burrito shell add a big spoonful of refried beans. Pile on some cheese. (Just a handful will do.) Now add the crispy corn tortilla. Spread on that simple guacamole we made. Spread on some sour cream. Add on lettuce and tomatoes. Now add another flour tortilla. Use a pair of kitchen shears to cut the burrito shell down to the same size as the corn tortilla. Fold the larger flour tortilla over the top. In a small bowl mash up the avocados (removing the skin and seed first, of course). Stir in juice from half the lime and the cilantro. Taste and add a little salt if you like. Set aside. Cook the corn tortillas in a hot skillet with a tablespoon of oil. The goal is to get the corn tortillas crispy, but not burnt. As I cook these I like to place them in between layers of paper towels (once removed from the skillet) to soak up any extra oil. Set aside. Cook in a hot skillet with a tablespoon or two of olive oil. To keep the flour tortilla shell folded in on itself, place a small plate or clean pot on top as it cooks. It looks a little funny but it works. After about 2 minutes, flip the crunch wrap over and cook the other side. Mmm, this looks delicious! I’ll probably make these before the weekend is over! ahh! i love crunch wraps! i always substitute the beef with beans too. you should try adding guacamole and potatoes, too…if you don’t already. it’s kind of a life changer. i love you. and i love crunch wraps. Gonna have to make it. I’m getting emotional over this one, you don’t even know my crunchwrap love. Wow, what an interesting thing to make. Looks and sounds delicious. I’ve never had Taco Bell but I’d bet your version of this dish is better than theirs! I always sub the meat for beans too! Yours looks delicious! This looks awesome. I want to try making it asap! This looks amazing. I want to try making them ASAP! That looks amazing – I can’t wait to try this out! Thanks for posting this recipe. My son doesn’t eat meat so this would be great for him! This looks amazing! I cannot wait to make it some Saturday! Awwwwe yeah, mak’n these for sure. Ok this is a genius recipe. I don’t eat taco bell so your version appeals to me much more! This looks so yummy! Great post. Some avocado would be great with that too! Ah! Yes! This looks marvelous! Love the ingredient combination! 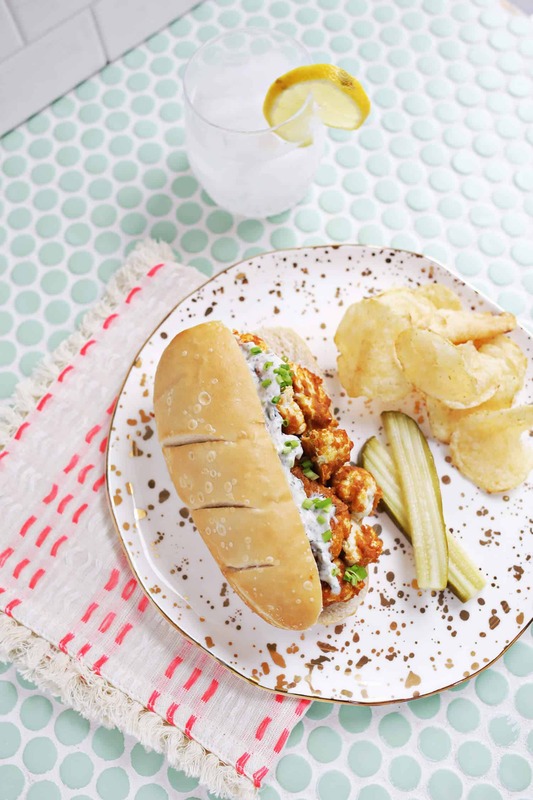 These easy lunch ideas are perfect! Such a simple concept, but I would have never thought of making one at home! Also, props for the cute cloth napkin! Genius. My family is going to go bonkers for this, thank you! oh my goodness! this is perfection! I can’t wait to try this. Not a fan of taco bell but I will totally try this! Oh my dear lord…this looks so good! I absolutely love the crunch wrap supreme, but this honestly looks so much better (not to mention healthier). Super yum points! Yum! This looks like a game changer! I feel emotional about this post. Words..omg crunch wrap supreme, I love these octogone mouth parties. Can’t wait to make one that isn’t filled with scary ingredients. Yummm…this makes me miss Taco Bell. So glad there is an option to make this delicious no-no for myself and others. You always ahve the best ideas!! It’s crazy and crunchy ! I love it! Oh Em GEEEEE!!!! Crunchwrap supremes are the only things I get at taco bell! This is the best! And the roadtripping concept is so perfect! I am gonna try to make these for my family this weekend for the drive from Toronto to Ottawa! Gonna be awesomecause! I would like to see the recipe all put together so could print out just that not all the photos. Is there some way you could do that? Look: This is what I made from it! Not so beautiful, but it taste good! Amazing! This is so brilliant. Taco bell is also my favorite guilty pleasure/road trip food. I always substitute refried beans as well, but I’ll have to check out the black beans. This looks so yummy!! I’m always looking for new vegetarian meal ideas even though I’ve been vegetarian for over 5 years. I might have to give this one a try! Nice job! Definitely going to try this here in the frozen wastes of Toronto, Canada. I’ve never, this sounds odd, had Taco Bell. We’re lucky to have a very vibrant Mexican community here so . . .
Looks delish …… will try it SOON! that looks so good right now! taco bell is one of my guilty pleasures so i love this recipe! These look so good! Adding them to next week’s menu! yum yum yum!!!! i’m a newbie when it comes to being a vegetarian and am in the market for meatless recipes. thanks for sharing this one! 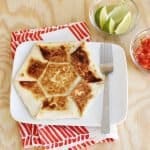 i love the crunchiness of a quesadilla and this looks perfect! I haven’t had Taco Bell in years, but this look delicious! I love making fast food-esque items at home since I don’t eat fast food anymore. Then I can customize it to be healthier, like these! mmm! Instantly started to drool – these look fantastic! You guys have had such great yummy ideas. Oooh yum! This is one of the best Taco Bell items! Looks delicious. I used to eat these all the time. Now, I will have to make them. Thanks for sharing! That looks fantastic! 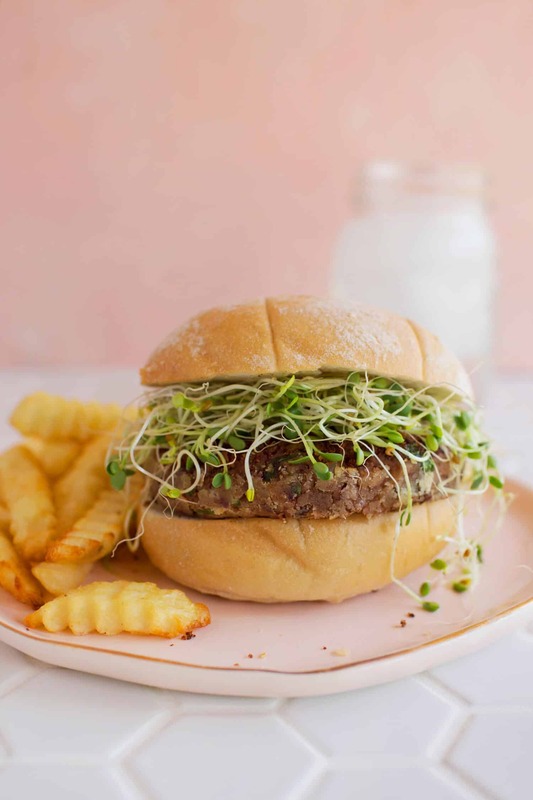 I keep looking for meatless recipes and this one is going to the top of my list. Yum! Got a chance to make these today in this crazy snow storm. You are a genius! They came out incredible! I’m not even a vegetarian, and I would absolutely eat this!! Looks so tasty! Thanks, these are delicious! Sending a couple on the plane with my boyfriend tomorrow. This looks delicious, and now that we’ve moved to England form good ‘ole Portland, Oregon, we’ve been craving mexican food! They try out here, they really do! We’ll be giving this a go for sure! Thank you for the deliciousness!! Genius way to make this healthier. Taco Bell is my fave. Thanks, Emma! Yes…. I think so…. THE BEST THINGS IN LIFE ARE HOMEMADE. I so love the pleated tortilla look and it sounds like an awesome snack! Potatos? Never heard of that, how would you prepare them? Shredded, like to make hash browns? It looks so yummy! Can’t wait to try it!!! Made this for dinner this evening! It turned out great! Thanks for the inspiration! Made this tonight.. they are amazing! I bet you could use tostada shells for the crunchy middle tortilla, and save a step. Thanks for the recipe. I’ll definitely keep these in mind for the future.